Oct. 31, 2017 - Scientists recently studied whether Egyptian fruit bats learn to “speak” from their mothers or from their colonies. They raised baby bats in captivity with their mothers and exposed the babies to three types of sounds. One group heard vocalizations from a real colony. A second heard manipulated sounds that were higher pitched than usual colony sounds. A third heard unusually low-pitched sounds. 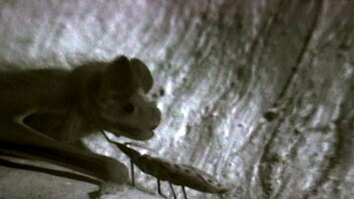 At six months old, the pups began to communicate in the "dialect" they were exposed to—suggesting a bat's “speech” is influenced more by its colony than its mother. 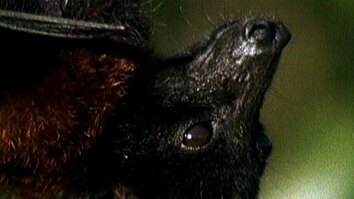 Scientists recently studied whether Egyptian fruit bats learn to “speak” from their mothers or from their colonies. They raised baby bats in captivity with their mothers and exposed the babies to three types of sounds. One group heard vocalizations from a real colony. A second heard manipulated sounds that were higher pitched than usual colony sounds. A third heard unusually low-pitched sounds. 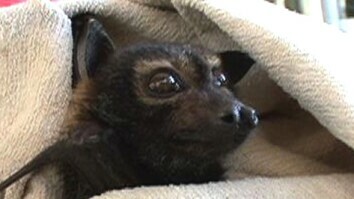 At six months old, the pups began to communicate in the "dialect" they were exposed to—suggesting a bat's “speech” is influenced more by its colony than its mother. Now enjoy some video of cute bats eating fruit.